I have an 07 sti and bought just the walbro pump, can it be straight drop in? Or do I need to buy the kit and hardware ? A: It may require some minor modification or adjustments, but the pump can be installed in your 07 STI. I am curious if there would be a problem running a higher lpm pump on the stock wrx system? I'm looking at a replacement but want something that will support future upgrades. Regards J. A: No problem at all! Throw this on and keep on driving! Will this pump support the injector dynamics 1050cc injectors? A: This pump is more than capable of supporting the Injector Dynamics 1050X injectors. I'm installing this pump into my 03 wrx and was wondering do I use the old harness on the stock pump or the new harness in the kit? A: Technically you could use the old harness, but both will work just fine. A: Sorry but we do not have confirmation that this will work for your Forester. A: Yes, this pump would support your setup as long as you were running pump fuel. If you plan to run E85, I would recommend a 300lph fuel pump. A: Yes, this fuel pump is E85 compatible. I have a 2005 STI. Will this fuel pump be okay with 1000CC ID injectors? A: This pump is able to support 1000cc injectors on pump gas. A: We do not have a confirmed fitment for this pump in that vehicle and fitment will be custom. can i get this for my car even though its stock? A: This would work fine in a stock vehicle. A: This is E85 compatible. A: Yes the installation kit is included. Does this pump come with a warranty? A: Walbro does not offer a warranty. I installed GSS342 in to my '06 WRX. I have blown out 2 seals right above the fuel filter. Two repair shops (dealer included) have not seen this before. I feel a bit lost about this and amlooking for any help on why this is happening. A: We have not had this situation reported before and it may be aging fuel system internals. Aside from the fuel filter sock, there's another fuel filter above the pump do I have to change that as well? please take a look at the picture that I uploaded for reference. A: If that fuel filter is bad it is recommended to be changed, but not required. Will this fuel pump support the Cobb 1000cc injectors?? A: This pump will support 1000cc injectors. This Fuel Pump fit 2006 Subaru Forester Xt? A: We do not have the Forester XT listed as a confirmed fit for this fuel pump and could not guarantee fitment. Is this pump E85 compatible? A: I recommend running a 320 LPH fuel pump for any injectors 1000cc or larger. Thank you. Would this fuel pump work on a 02 WRX? Also, how long is this sale going for? I'm planning to buy one soon. Thank you. A: This will fit your WRX with no issues. 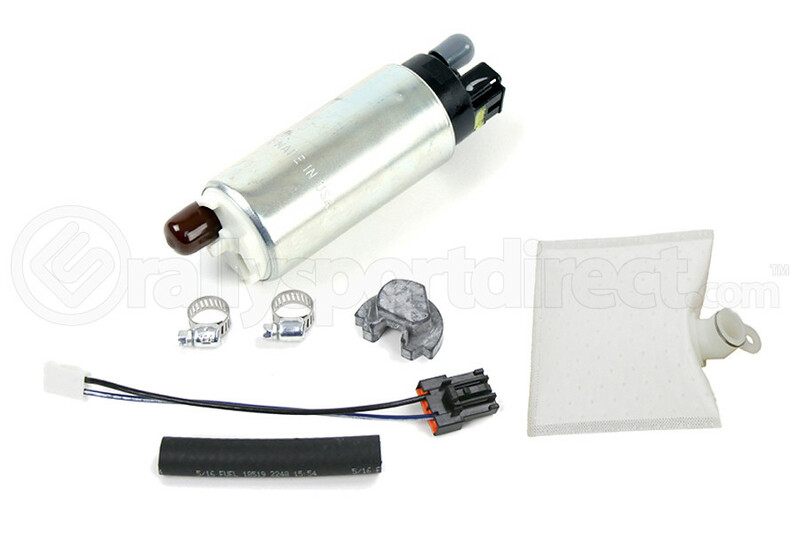 Will this replace the stock fuel filter as well or do I have to replace that seperatly? A: This will come with a new filter. Hello. Will this pump suitable for wrx 2005 without any reflash? A: Yes, this fuel pump is confirmed to fit on the 2005 WRX without any modifications. Your stock ECU will regulate the fuel pump, just like the stock pump so there is no need for a retune. Thank you. Will I be able to pass CA emissions/inspection with this part? A: Fuel pumps are generally not inspected and they should not have any affect on emissions, but you will want to check with your local emissions department. Will this fit my 06wrx without any modification? A: This fuel pump and install kit is confirmed to fit on the 2006 WRX with little to no other modification or fabrication. Thank you. is this pump e 85 compatable?